A U.S. Coast Guard Approved alternative to flares! 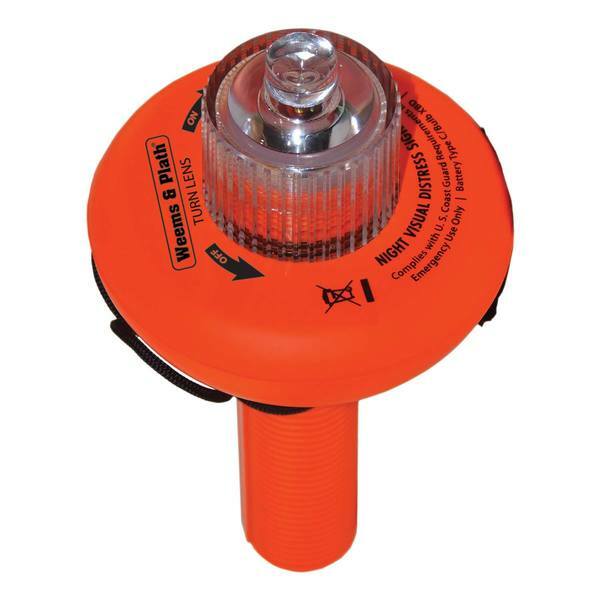 The SOS Distress Light is the first and only LED Visual Distress Signal Device that meets U.S. Coast Guard requirements to completely replace traditional pyrotechnic flares. Unlike traditional flares, this electronic flare never expires which solves the challenge of flare disposal. Omni-directional horizontal beam plus vertical beam: SOS Distress Light is an LED SOS visual distress signal powered by a high-performance, programmable microprocessor controlling an SOS signal flashed though a potent CREE LED bulb. Provides an omni-directional light display for surface rescue craft and a vertical beam visible to aircraft flying overhead. Dimensions: 8 1/2" H x 4 1/2" dia.